"It is not unusual, when everyone struggles and maintains their own dreams. There are those who strive to pursue high education to be able to achieve their dreams. There are those who struggle to try various things and activities to be able to find a certain passion in him. 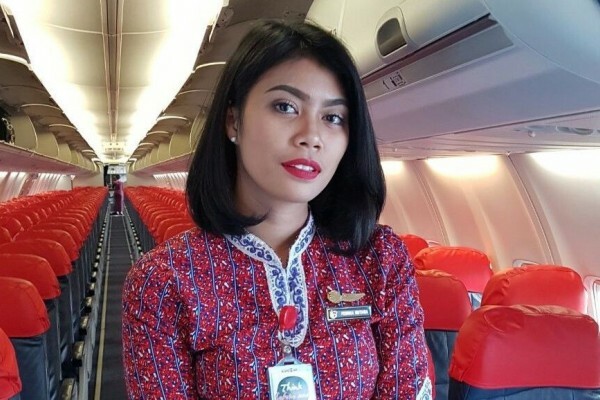 There are also those who struggle to survive on a job because that is life, the way is not always in accordance with what we think and want, " said the flight attendant named Febrika Mutiara Kristie. Yes, this is a story of a tough woman, also a former model who has participated in several contests and shows this model which finally decided to challenge herself to work serving the community as a flight attendant on one of the airlines in Indonesia. Not a few who look at the eyes of the work he chooses and say that this job is relatively easy. But who would have thought, behind the many comments and views of people, there was a struggle and effort that was not easy and touching. There is a time that is sacrificed, there are families left behind, as well as simple things that we often do not realize but become very valuable for those who work in the world of aviation. Pearl Kristie's Febrika career journey is not an easy journey as people think — about being a flight attendant. Travel out of town and even the country, have a large income, work in space that is not jammed and not tiring, and so on. At the beginning of his career as a flight attendant, this woman who was familiarly called Mutiara had to forge herself with a system of 'seniority' work and no time. He attended flight attendant education for 4 months after previously studying in the travel department. The principle that he holds makes him firmly confront the various difficulties that come when in the process of determining his career. "I don't want to bother my parents," admitted Mutiara. His sincerity not to trouble his parents in terms of spending a lot of money to fulfill his needs, including education, encouraged him to become an independent woman. He was willing to work to help parents and give me the opportunity, as his twin brother to be able to pursue a higher education. Thus, he learned to choose and make a decision to run a career as a flight attendant with so many pros and cons. He believes that life is a choice, not everything goes according to what we want. 2. 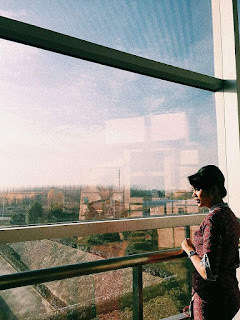 "If it meant to be, it will be"
There is one thing that is so inspiring from Mutiara's words, she said: "Often we are disappointed with dreams that are not realized or the reality of saying is different from what we think. But perhaps it is true that one aspect of human maturity is formed when we taste disappointment." 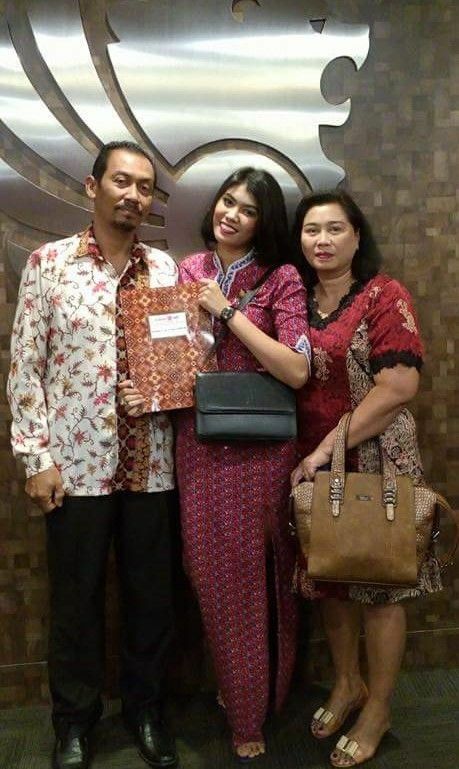 Although he was rejected several times during interviews with unclear reasons, Mutiara continued to try hard to register as a flight attendant to be able to boast about her parents and help her family's life. Until finally after trying several times, he was contacted to attend further education. "I believe, if something has to happen, it happens," he said. If he is indeed permitted by God to be the pride of his parents, then he will continue to strive to be the pride of his family. Behind the success that others see in Mutiara, there are of course many stories and experiences that mature them. There are people who mencibirnya by saying "How can it anyway he became a flight attendant? ", "Why not college? ", And so on. "Success is not always determined by how much and how long the title is behind someone's name. It is hard work and God's design that determines", said Mutiara. 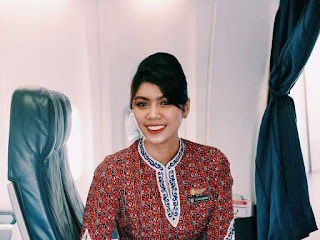 Even though many said that it was good to be a flight attendant, Mutiara had to fight hard in the midst of the cruelty of seniority in her workplace and she had to face a harsh system. He had wanted to give up when faced with the world of flight attendant work, where so many 'wolves in sheep's clothing'. People who are willing to do anything to get a position. Mutiara stressed that even when studying, not only the brain is sharpened but mentally it is also forged. He was trained in dealing with various people with diverse characters. The passengers who considered flight attendants were 'helpers' on the plane in the sense that they were told to carry their heavy belongings and they immediately sat comfortably on the plane. Once, he and his friend were on a flight assignment and met one of the passengers in a city. The passenger went up and authoritatively ordered the cabin crew to carry his large bag and put it in the trunk located above the passenger seat. Then the passenger just sat down. Because it was too heavy, the cabin crew's wrist even sprained and felt extreme pain. But the passenger didn't care because he thought that was the job of the flight attendant. Many still mistaken this one job, but Mutiara did not give up. Many do not believe when many flight attendants tell how tiring they are and how saturated they are. Pathetic isn't it? Though flight attendants are also human. Flight attendants must have a hard day when they are sick. They cannot just permit because they will get a strong reprimand from the company, not to mention the abuse from their superiors. Even for grief events, they still have to prioritize their work, unlike some other jobs that provide exceptions for grief events. A flight attendant is required to work very professionally. There are still many who indicate the work of flight attendants as 'bad jobs'. There are still many who look at the eyes of this work, Mutiara proves that this is all back to each individual. They are paid dearly for their time, because they lose so much time with their families. "But that's life, there is always a price to pay. There is a big risk behind my work, there is a very boredom and fatigue behind my smile in front of passengers. 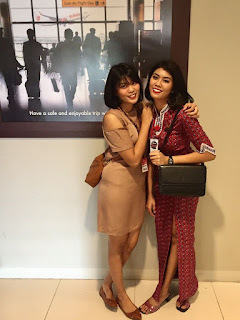 I have to get ready two hours before departure, even I face dawn flights," said Mutiara . They are vulnerable to radiation, serious jet lag , and fetal health problems. "Actually, I believe there is no result that betrays the process," said Mutiara. 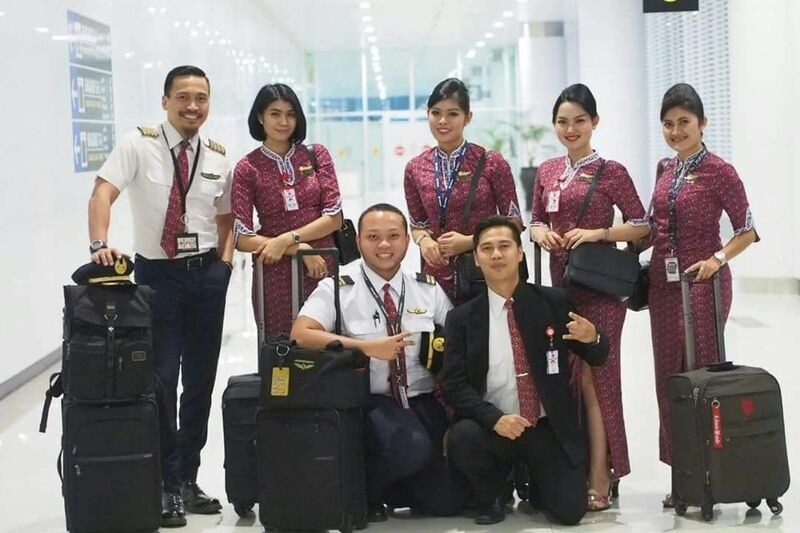 Now Mutiara has become a Senior Flight Attendant, after several years he worked at his company. He also carries greater responsibility. For those of us who work in offices and on land, perhaps we don't realize that the small and simple things that we have encountered so far are very meaningful. Like every Saturday and Sunday holiday, going home and meeting relatives, adorable nephews, can arrange vacation plans on certain dates such as red dates and long weekends , can go to the place on weekends, go home and eat mother's food. These things are certainly not always felt by Mutiara and her colleagues who work as flight attendants. Pearl also must be willing to stay far away from me and live independently. While we are always together from childhood, even when we are pregnant, we are together. It is sad because at this moment we have each other's activities and can only meet at least once a week. Mutiara cannot always meet her parents and many times cannot follow important events in her life because of the demands of work. But this is what makes him a strong and inspiring woman. He can independently fulfill his life needs and boast of his parents. We often miss our soul mates. Mutiara is willing to work hard to be able to help me as her twin sister to achieve her dreams and dreams, including taking a high level of education. Because of his sincerity to the family, he persevered with all because he believed that there was nothing in vain used by God in his life, including his longing for family. Now he has been dealing with so many passengers and colleagues. This made him often called and asked to share his experiences about his work in several schools. It is amazing that it can be inspired for the millennial generation and also the people closest to it. Even though there are many scorns and amidst a difficult lifestyle, Mutiara continues to struggle to make her parents happy in a good way. He struggled to become a Senior Flight Attendant, to preserve a culture of courtesy and courtesy without bullying to other colleagues. "I aspire to be able to create a comfortable flight atmosphere for cabin crew and passengers without having to brag and say rude or authoritarian to colleagues who are relatively new," said Mutiara. Life does not merely give us what we want, but he believes that his presence must be a blessing to others, especially to not be authoritarian to his colleagues just because of a higher position.